The single-mode fiber has a uniform ytterbium doping concentration in its step-index core. The amplifier is continuously pumped until the steady state is reached. Then we inject a short signal pulse, which extracts much of the stored energy. 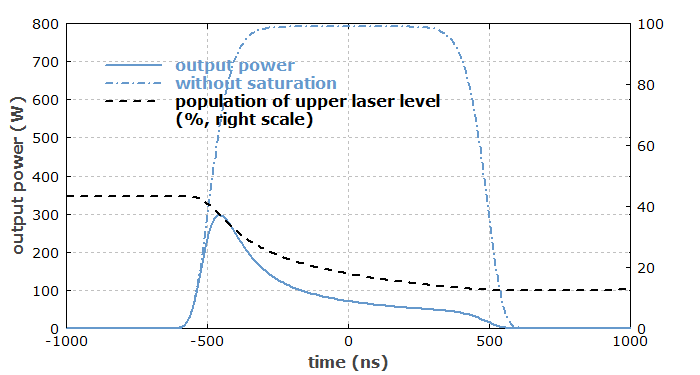 The figure below shows the output power as a function of time, and for comparison the output power as it would occur without gain saturation. Further, the figure shows the fractional excitation of the ytterbium ions, which is substantially reduced during pulse amplification. Therefore, the gain drops, and the trailing part of the pulse is much less strongly amplified than the leading part. As a result, the shape of the amplified pulse is substantially distorted. Figure 1: Output power and ytterbium excitation versus time. Such simulations are possible not only for a simple electronic level scheme as that of ytterbium, but also for complicated user-defined level schemes. It is therefore possible, for example, to investigate the influence of a “bottleneck” arising from a finite transfer time between two electronic levels. It would also be possible to consider arbitrary time dependencies of different optical channels, e.g. when both pump and signal are pulsed. With a few lines of script code, one could even automatically calculate the input pulse shape as required to obtain a certain output pulse shape.